Meyer's Rock Court on Route 66 between Kellyville and Sapulpa. 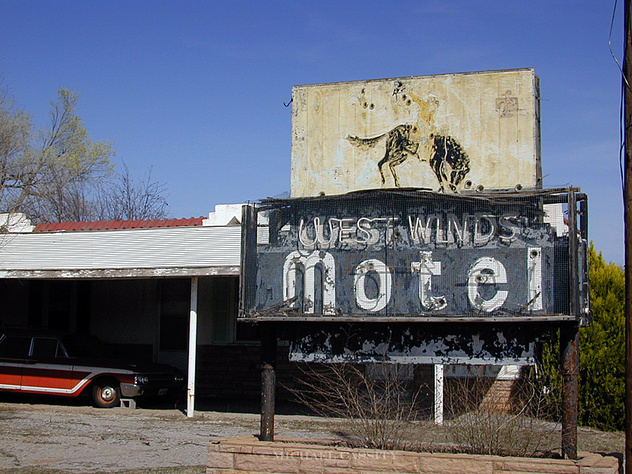 West Winds Motel, Route 66 in Erick, Oklahoma. 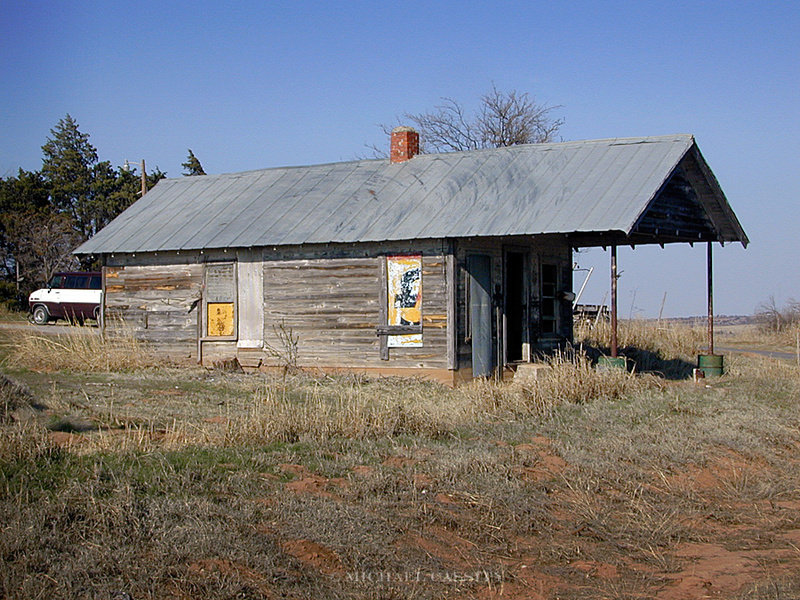 The 2002 survey of buildings, structures, objects, and sites associated with U.S. Highway 66 in Oklahoma was part of a larger survey undertaken by the Route 66 Corridor Preservation Program, Long Distance Trails Group Office of the National Park Service. Similar surveys were undertaken in other states, and in Oklahoma the survey was administered by the Oklahoma State Historic Preservation Office. The survey covered the entire route of the highway in Oklahoma, but that also included the different alignments that the highway took over time. Indeed, one of the keys to understanding the road is something often forgotten by people who talk (and write) about it as if it were an unchanging roadway, frozen at a particular point in time: the highway and the commercial and public features associated with it evolved over the years. The highway was not the same in 1935 that it had been in 1927 and it was even different in 1950, not to mention 1965. The survey was an ambitious project and covered a lot of miles and a lot of features. I surveyed the highway from one side of the state to the other except for metropolitan Tulsa and Oklahoma which were examined by Heath Henry. I also wrote the statement of historic context exploring the evolution of the highway in the state. 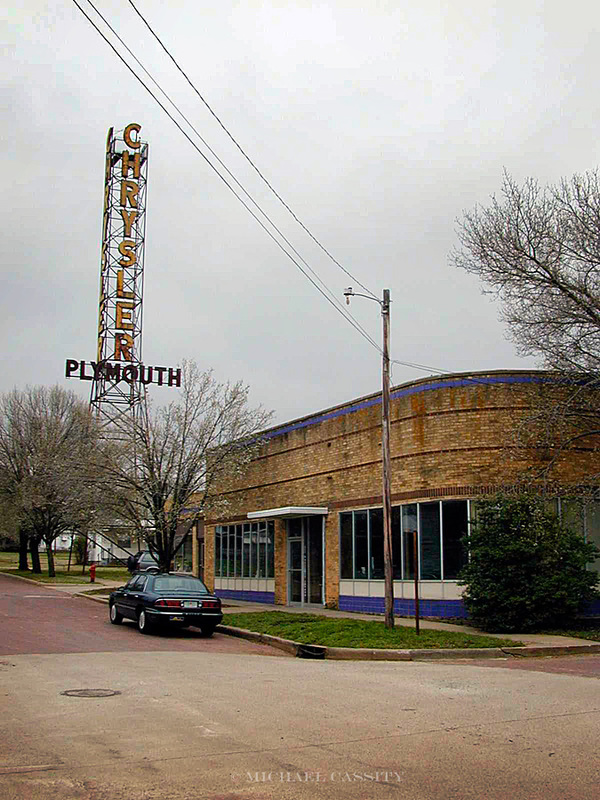 The survey examined the variety of property types along the highway including the obvious motels and service stations that owed their existence to the roadway and its traffic, but also the roadside parks, the automobile dealerships and repair shops, the tourist attractions, the diners and cafes, the campgrounds, and the many other commercial and public resources. Just as it is important to understand that the highway and its related features changed over the decades of its existence it is likewise critical to see the highway as part of a process of social and economic change. We are not just talking about architecture; we are talking about the transformation of society, a transformation that was shaped by forces of Depression (as, ironically, the same highway that provided an escape route of impoverished people on their way to California seeking new opportunities provided commercial opportunities for people who set up low-capital businesses alongside the road to cater to their needs), by forces of World War II (and the rise of military installations along its path), by forces of post-war prosperity that ultimately generated enough traffic to undermine the road itself and spawn its replacement--the interstate highway system. Bridgeport Filling Station atop Bridgeport Hill, vicinity Geary. Beard Motor Company near Route 66 (sign attracted traffic from the highway) in Bristow.